The eruption of Santorini in Greece in 1,650 B.C. was one of the largest (VEI=6) in the last 10,000 years. About 7 cubic miles (30 cubic km) of rhyodacite magma was erupted. The plinian column during the initial phase of the eruption was about 23 miles (36 km) high. 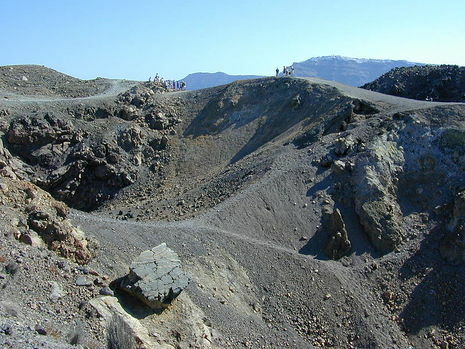 The removal of such a large volume of magma caused the volcano to collapse, producing a c aldera. Ash fell over a large area in the eastern Mediterranean and Turkey. The eruption probably caused the end of the Minoan civilization on the island of Crete. An international team of scientists has found that the second largest volcanic eruption in human history, the massive Bronze Age eruption of Thera in Greece, was much larger and more widespread than previously believed. During research expeditions in April and June, the scientists from the University of Rhode Island and the Hellenic Center for Marine Research found deposits of volcanic pumice and ash 10 to 80 meters thick extending out 20 to 30 kilometers in all directions from the Greek island of Santorini. Not much is left of the Santorini Islands, among Greece's prettiest tourist sites. They encircle a massive volcanic crater, where more than 3,500 years ago one of the largest eruptions in recorded history took place. 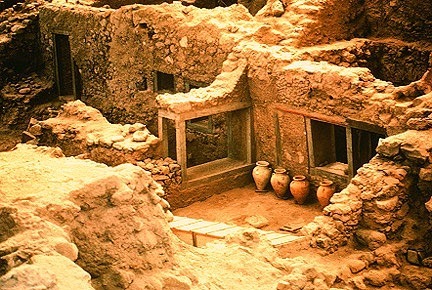 The blast entombed an ancient town, Akrotiri, and seemingly altered the course of world history. And now the survey indicates that the eruption was even more powerful than once believed. 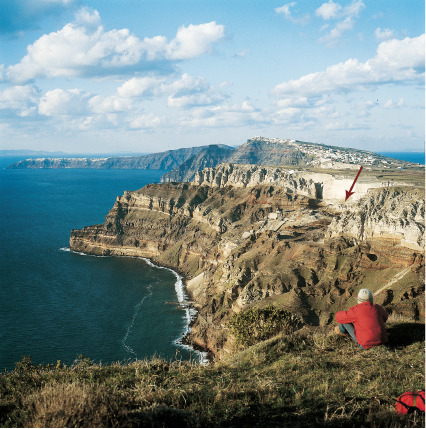 "The Minoan eruption of the Santorini volcano has remained of great interest to geologists, historians, and archeologists because of its possible impact on the Minoan civilization in Crete," notes the survey in the August 22 Eos journal. The Minoans were major players in the Eastern Mediterranean from roughly 3,000 B.C. to 1550 B.C, when the ancient Greeks, the same guys who went on to besiege Troy, took over. The late Greek archaeologist Spyridon Marinatos in 1939 proposed that the eruption, a scant 70 miles away from Crete, caused the end of the Minoan civilization. The Minoan eruption of Thera, also referred to as the Thera eruption or Santorini eruption, was a major catastrophic volcanic eruption (Volcanic Explosivity Index (VEI) = 6 or 7, Dense-rock equivalent (DRE) = 60 km3) which is estimated to have occurred in the mid second millennium BCE.The eruption was one of the largest volcanic events on Earth in recorded history. The eruption devastated the island of Thera (also called Santorini), including the Minoan settlement at Akrotiri -- as well as communities and agricultural areas on nearby islands and on the coast of Crete.